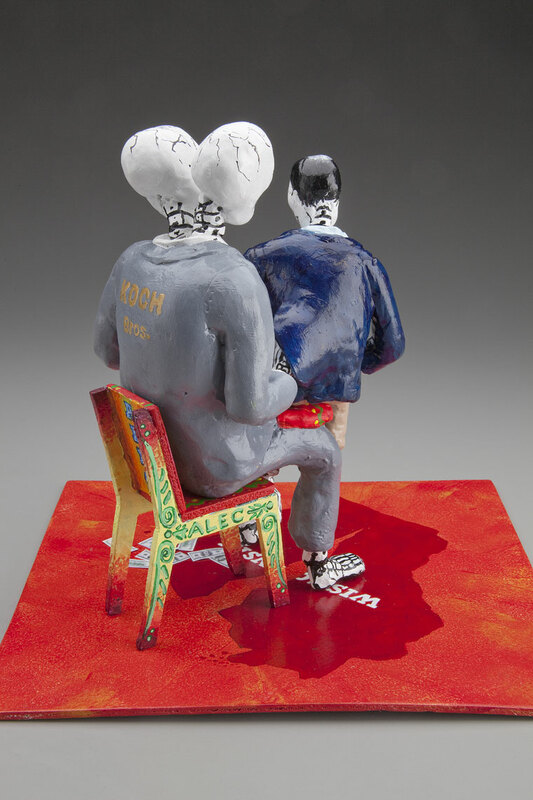 Various themes were employed to integrate or commingle the different media used in this work. 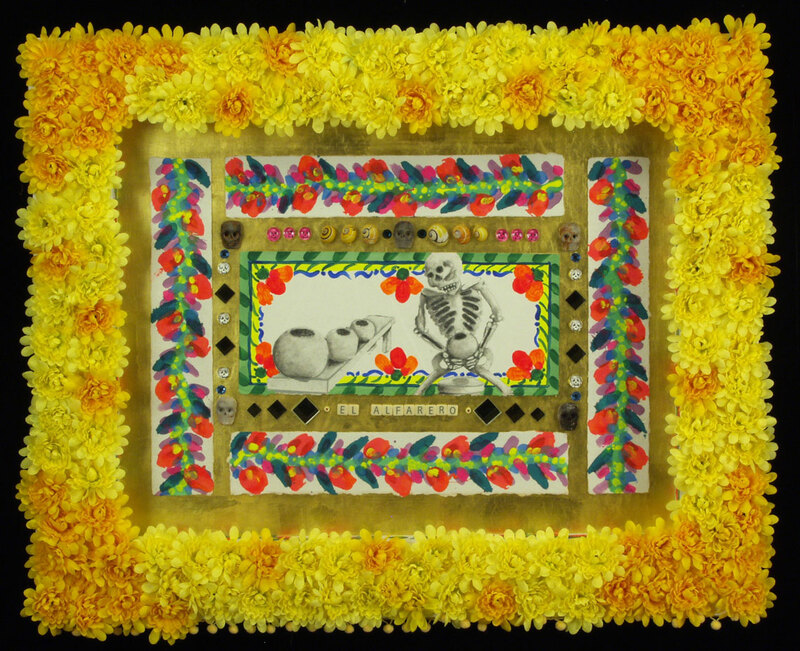 The Mexican festival, “Dia de los Muertos” (The Day of the Dead), is the primary theme used to incorporate play with paper and clay. 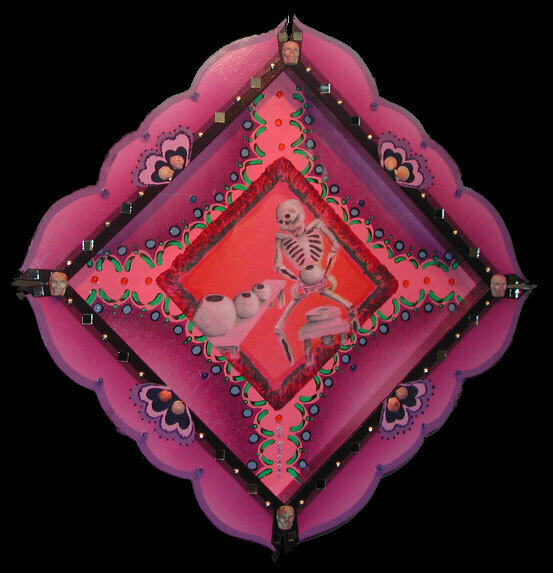 Some people may find this work morbid at first until they understand my fascination with the folk art created by Mexican artists. 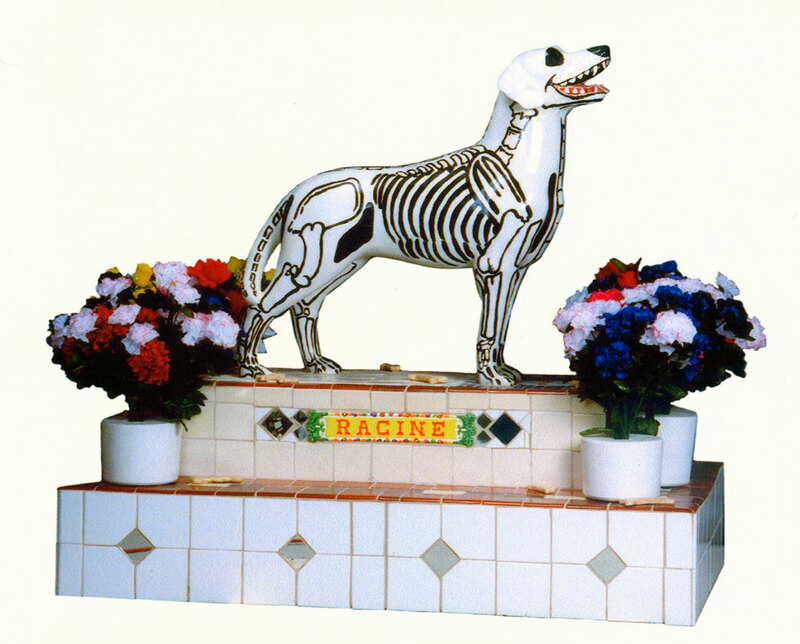 The skeleton, human or animal, is the Mexican symbol of death. 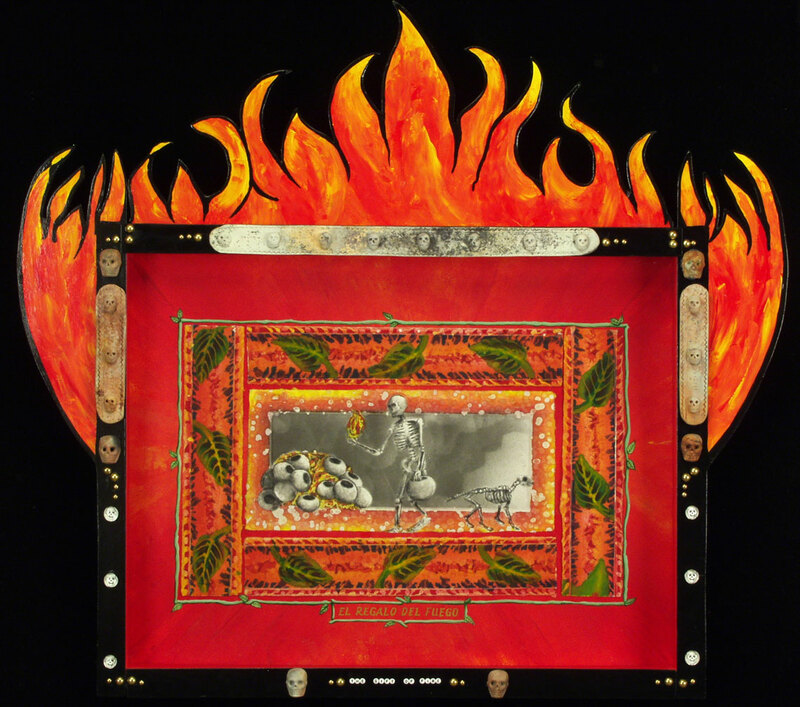 It is the vehicle for folk artists to create a dialogue with death. 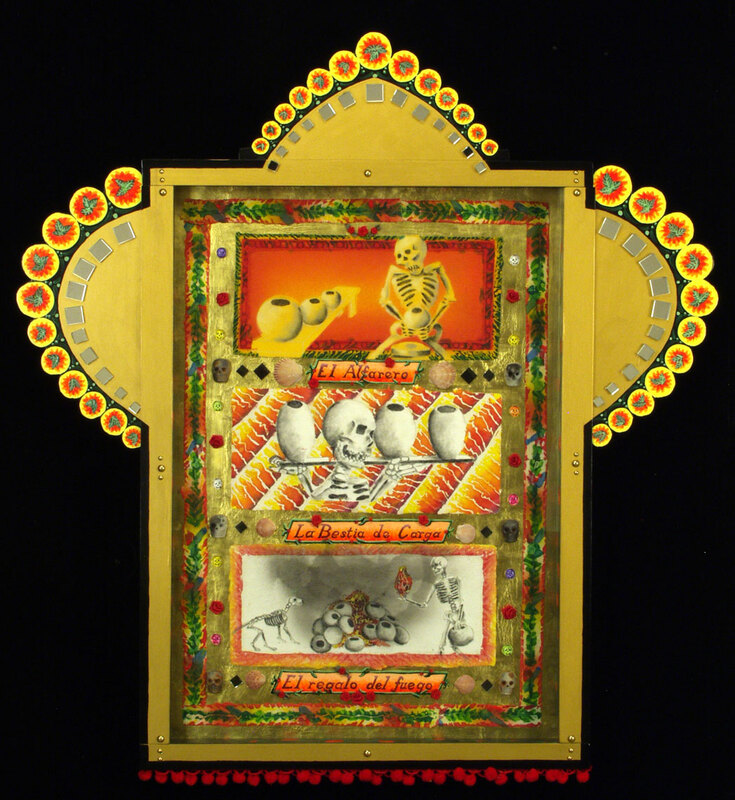 These artisans represent death with a sense of humor, affection, satire and charm. 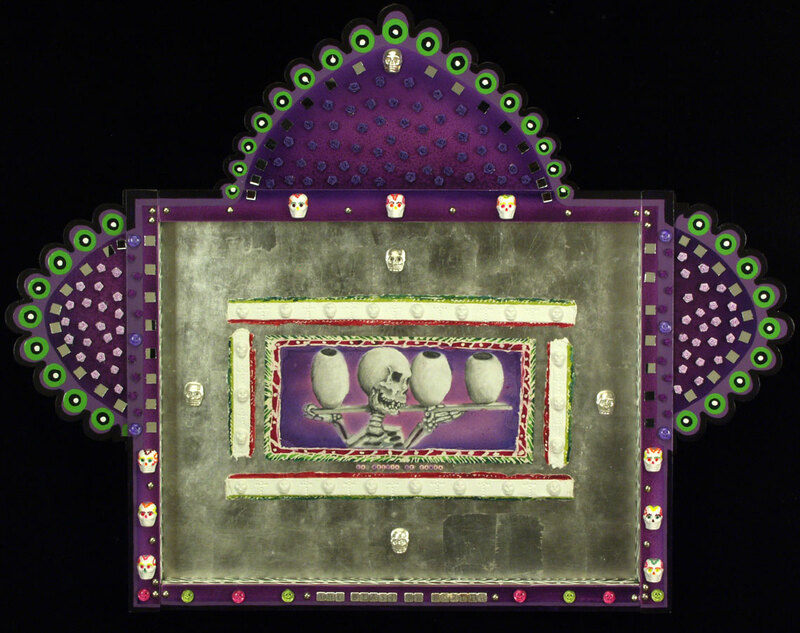 Their work reflects the Mexican culture’s tradition of honoring the dead. For Mexicans, death is free of the taboos imposed on it by our North American culture. They have simply come to terms with the obvious—the inevitability of death and the idea that death must always be integrated as part of life. One cannot celebrate life without celebrating death. Death is not something to feared or dreaded; it is part of a natural process and life and death are part of the same cycle. 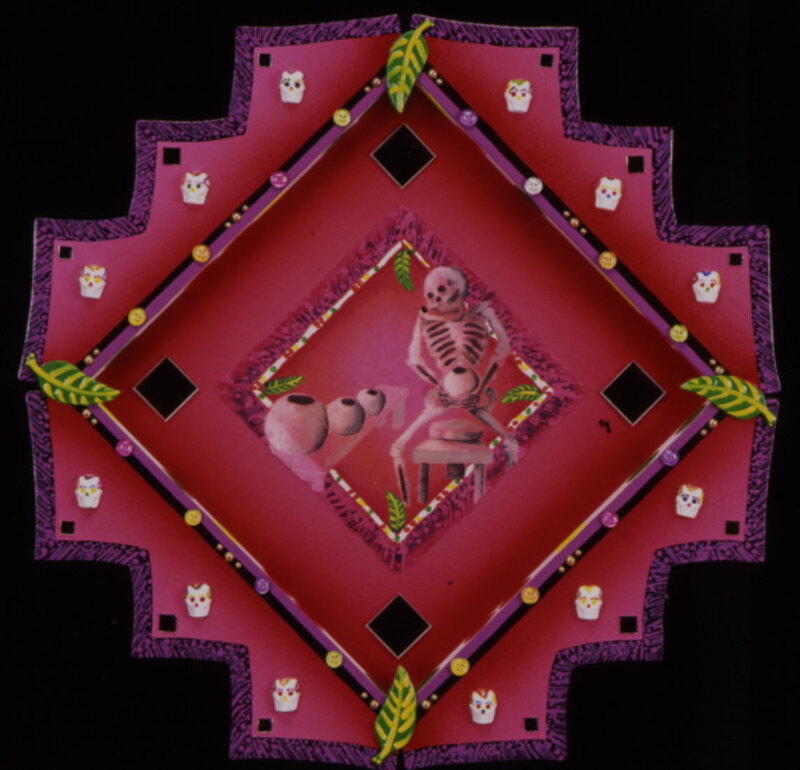 The Day of the Dead festival has roots in ancient religious rituals of the indigenous people of Mexico, Central and South America and the Catholicism brought to Mexico by the Spanish. The festival is celebrated on November 1st and 2nd. In the Catholic church, these dates are called All Saints or All Souls Day. Throughout my life as a potter, my work ethic has been inspired by the fact that my time on earth is limited. Each human being wants to leave behind a legacy of their time on earth. For any artist, that legacy is the body of their work. The reality of my own mortality keeps me focused on my creative endeavors. The expression of my life’s work can be seen in the trail of work I leave behind. 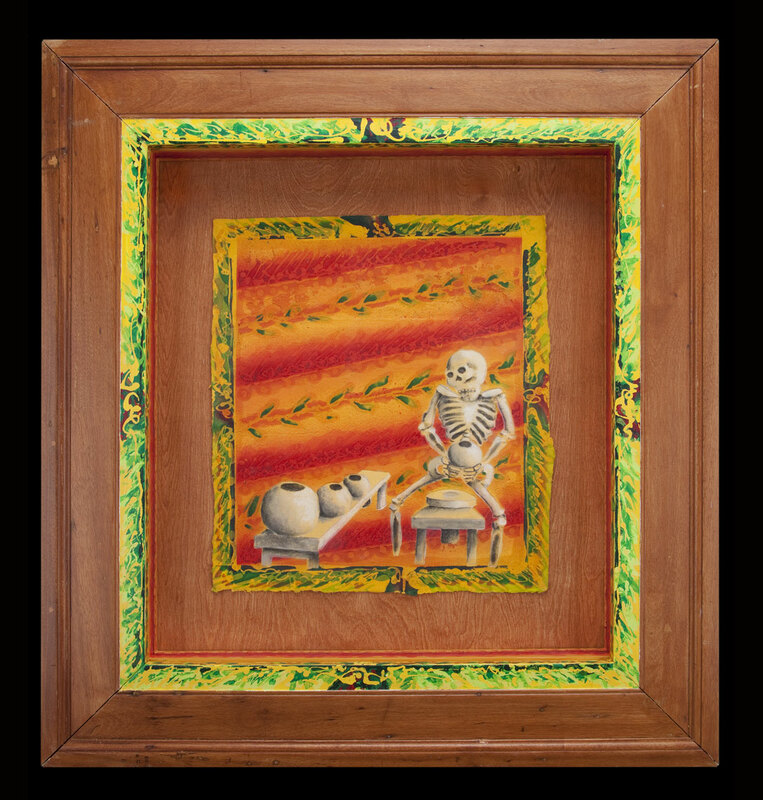 The titled work on the right contains a piece grouping three panels that illustrate aspects of my life as a potter: El Alfarero, Series Del Dia Del Los Muertos, that is, The Day of the Dead Potter Series. 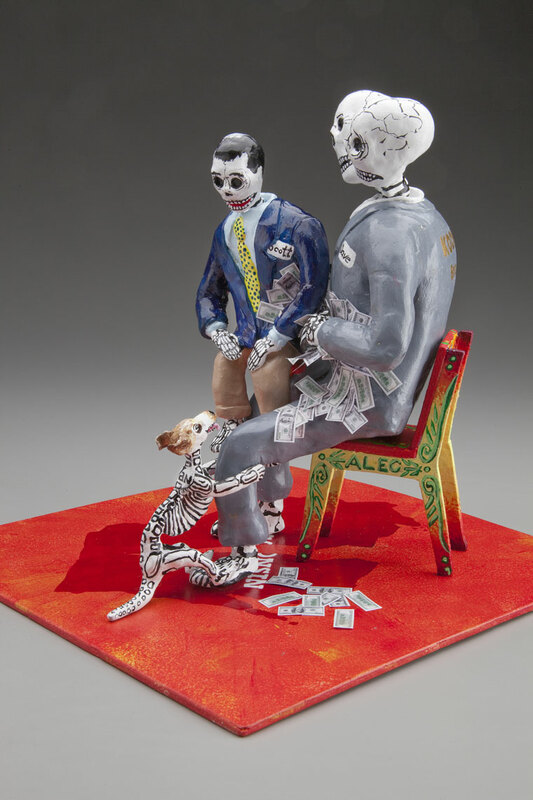 The Bad Dogs sculpture, made of polymer clay, was inspired by the work of Mexican printmaker, illustrator, and editorial cartoonist José Guadalupe Posada (1852-1913). 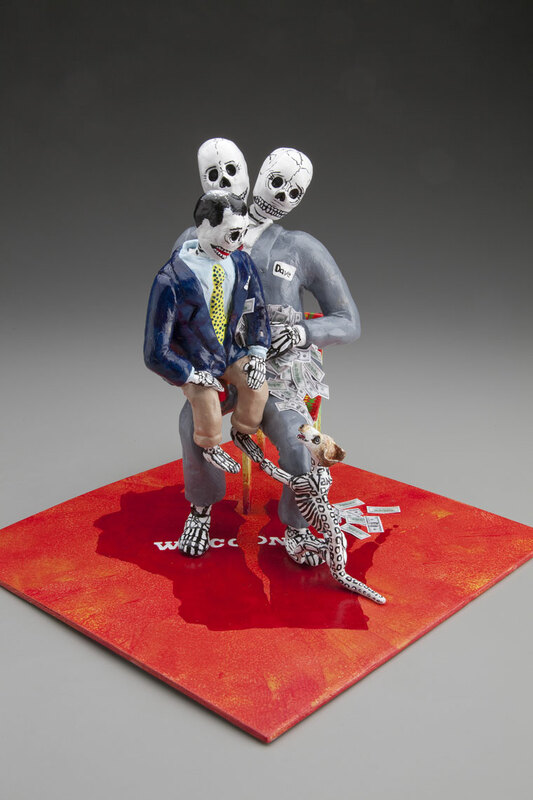 Posada used the skeleton to portray political figures and his contemporaries in order to emphasize their mortality and bring them down to size. “In death we are all equal. Blonde, brown, rich, poor, we come to the same fate.” Some of his best work focused on President Diaz and his high society supporters during the Mexican Revolution. 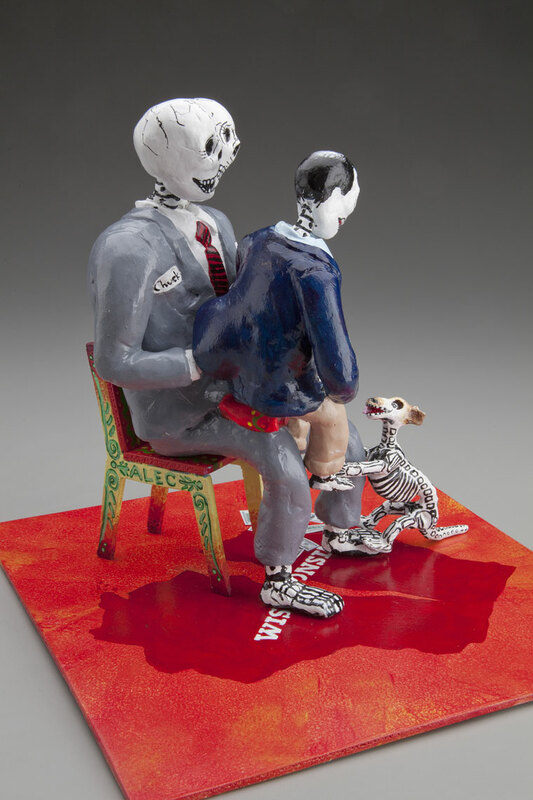 The Bad Dogs cast of characters include the Koch brothers, Scott Walker, State Senator Van Wanggaard, the Money, and A.L.E.C.